Haswell's successor is code named "Devil's Canyon" and it's here for us to check out today. And it turns out that the LGA 1150 socketed processor is compatible with both Z87 and Z97 motherboards which is great news for all enthusiasts. In short, Devil's Canyon has two major revisions, which include a better thermal interface underneath the aluminum cap and a higher 4GHz base operating frequency than Haswell. 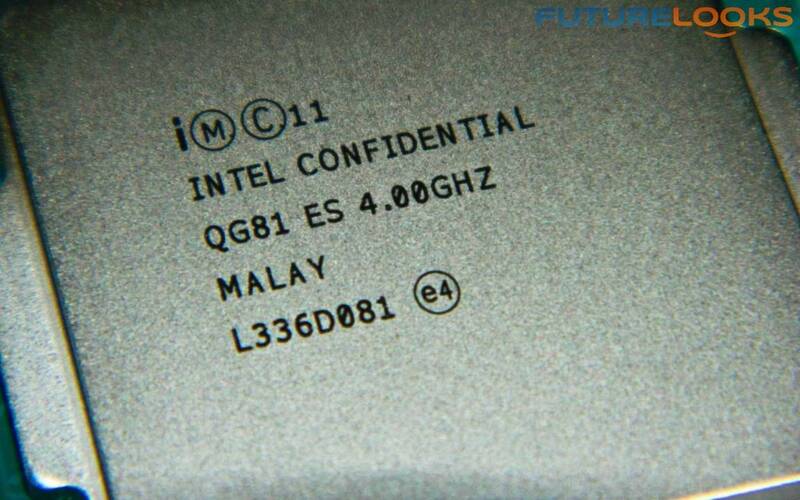 The two simple questions we asked right away are, does the new processor actually run cooler than Haswell? And, will that 4GHz base frequency be an advantage without melting down itself? With the latest Z97 hardware in hand, we find out! 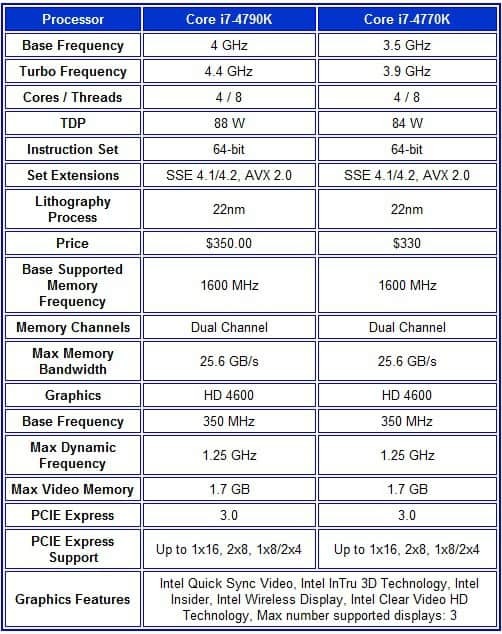 From just this table, you should be able to see the biggest change is the Base and Turbo frequencies. Haswell starts at 3.5 and Turbos to 3.9 GHz. Devil's Canyon starts at 4 GHz and Turbos to 4.4 GHz. What this means is that CPU intensive applications and projects should speed along more noticeably, than previous incremental updates. But, it also means heat dissipation is very important to keep cool. To handle the thermal physics, Intel has refined the die architecture to require less idle voltage, achieving the frequencies using a similar load voltage to Haswell, and they have also improved the thermal interface under the aluminum IHS top. A huge complaint of Haswell, leading to much "delidding" and repasting, to achieve higher overclocks. The processor itself has two new updates I'm happy to see. The first is Directed I/O (VT-d). This is good news for users who run VMs. It was missing from the 4770K which I can personally attest, was a little behind the curve in that arena. 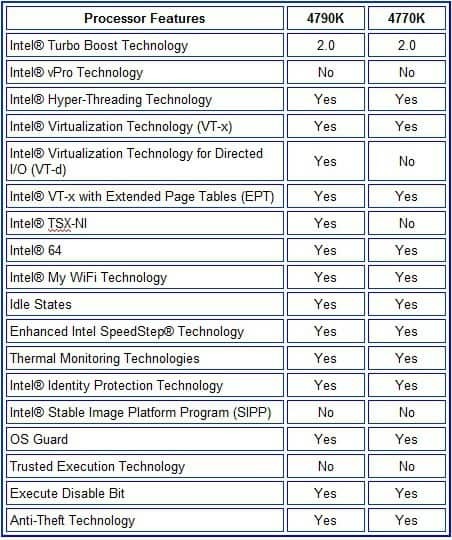 The second update is Intel TSX-NI which should make programmers happy. According to February 2012 article by James Reinder, TSX-NI is useful for shared-memory multithreaded applications that employ fine grain and course grain lock-based synchronization mechanisms. Any time execution can be increased, it's always a good thing. To keep things simple and neat, I tested the Intel Core i7-4790K on both a Z97 and Z87 motherboard. The same CPU cooler, memory, SSD, graphics, and power supply was used on each test system in an open test bench. In motherboard reviews, I set a maximum operating temperature of 80C and 1.4 volts as the threshold. However, in these tests, we're pushing up to 90C and 1.45 volts respectively. Keep in mind that there is a very good chance your processor performance will degrade over extended use at these more extreme levels. The room temperature is 20C which is a good comfortable level. In terms of software, our operating system of choice will be Windows 7 professional, and we'll be using SANDRA Mathematical and Multimedia, Cinebench R11.5, Graysky 5.0 H.264, PCMark7, Assassin's Creed III, Battlefield 4, and Crysis 3. Each of these will give you an idea of the execution and internal bandwidth capabilities. Thermal testing will be done underneath the very capable be quiet! Dark Rock Pro 3 cooler, and that completes our suite of tests. Short and sweet. Let's get on with it!